Here at Marjorie P. Lee, we offer a full suite of person-centered cognitive therapies for our residents with Alzheimer’s and dementia. It’s called Living Well Memory Support, and it’s one of the most comprehensive suites of memory care programs in the Cincinnati area. And while you may have heard of art therapy or music therapy programs for seniors, these aren’t your typical therapies. 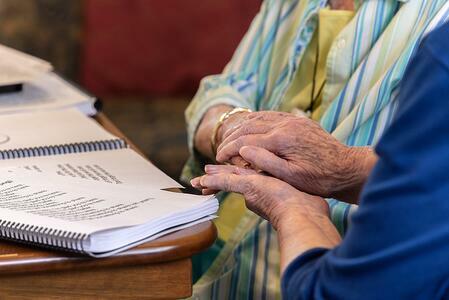 Today, we’re proud to tell you more about our Java Memory Care program. Java Memory Care differs from traditional forms of music therapy because it’s not based on what a staff member can do for residents, but rather what residents can do for each other. The concept that people are happiest when they are helping one another is the basis for the program, which has been implemented in over 600 locations across North America. 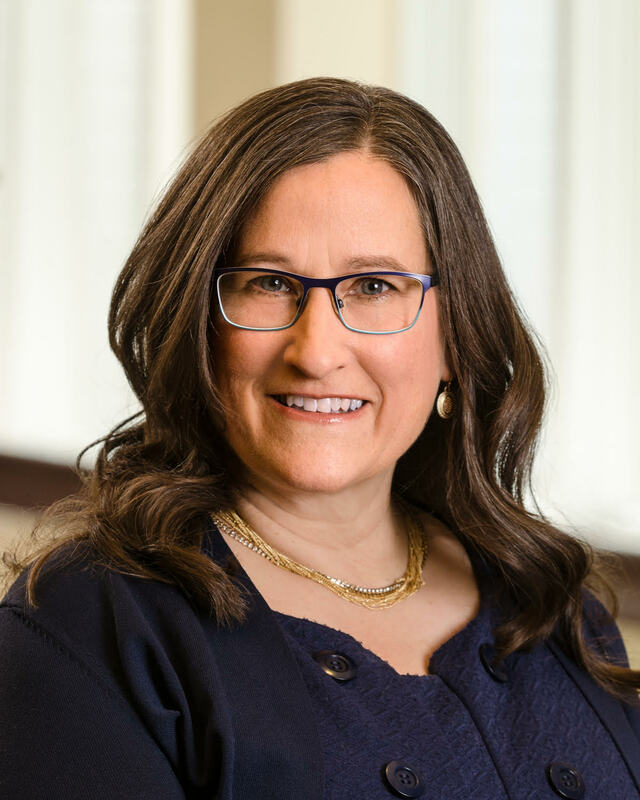 Java Memory Care focuses on peer support — residents helping residents — which adds purpose and meaning to their lives, according to the program’s creators, Java Group Programs. Three years ago, Marjorie P. Lee Retirement Community chaplain Angelo Puopolo worked with staff to incorporate Java Memory Care into our suite of memory support programs. 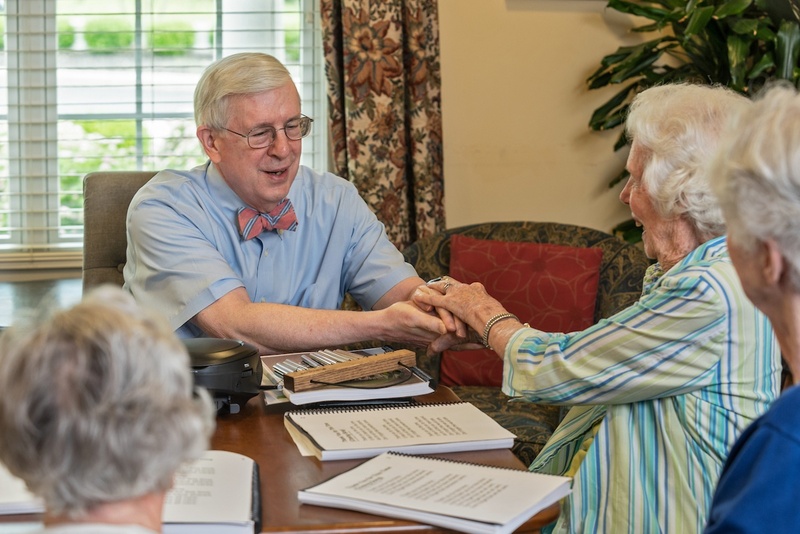 He and three other ERS chaplains host Java Memory Care jam sessions several times a week with residents of Marjorie P. Lee’s Morris and Kirby households and Deupree Cottages on the Deupree House campus. “We have such a good time that the staff often hang around and join in,” Angelo told us in a recent Linkage article. Music has proven powers to spark memories, thoughts and connections previously believed lost. As such, each Java Memory Care session has a theme that uses readings, photos and group singalongs to inspire discussions and foster support among residents. During a typical Java Memory Care session, residents and a Java leader start with an opening song, then pass around a wind chime and shake hands. They decide on a theme for the day, and then the Java leader asks questions centered on the theme. For example, a recent theme was “Getting to Know You,” inspired by the 1950s Rodgers & Hammerstein classic, and each resident had a chance to share something about themselves that their fellow residents didn’t already know. Sessions also include group singalongs and opportunities for residents to talk about something special they have to offer others — or something they think is special about their fellow residents. Because Java Memory Care allows residents to share fond memories and music from their younger days, Angelo says they’re often sorry when the session comes to an end. Interested in making memory support programs such as Java Memory Care a highlight of your senior loved one’s week? Click here to learn more about all of our Living Well Memory Support programs or get more information. Or, schedule your tour here to see for yourself how we’re fighting Alzheimer’s and dementia in positive and powerful new ways.